* Boston Skeptics in the Pub: "How Tigger Lost His Boing: Molecular Quackery"
* Winedown: "Passing the Baton"
* "Iron Pour: Magic, Fire, Music, and Dance"
Boston Skeptics in the Pub: "How Tigger Lost His Boing: Molecular Quackery"
Go upstairs for the communal skepticism. How many of you have heard of the morning benders? I don't think I have before this week. They have a strong sense of songwriting. I get a feeling that their fanbase mainly consist of young girls, but I could totally be off-base... It's going to be a good acoustic set, if you can get in. The press clips compared Chris Robley to Elliot Smith and Lennon, and I was skeptical enough to want to drink in a pub (see above). There is some Elliot and John in Robley's songs, but it's not impersonations. Although he is from Oregon's Portland, and he's playing with Audrey Ryan from Bar Harbor. Audrey probably doesn't care about the 'other' Portland, but I can have New England pride and declare her to be the true reason to go out on Monday night. Her high, hyponotic melodies carry the thoughtful lyrics around the room and land to tickle your ears. Stop by for a little wine and conversation with Frank Kramer (store owner for the last 30 years) and Jeff Mayersohn (new owner). I wouldn't go out of my way, but I find Frank's story very interesting: He took over the book store in his early-20's(?) after both of his parents died and didn't expect to be in the book business for this long. From what I've heard the quantity of free booze is not as great as I remember from my Milky Way experiences, but there will be 'tastings' of various Sam brews from 9pm to 10pm. Three lanes will be alloted for a 'bowling tournament' -- with prizes -- starting at 9:30pm (first-come, first-serve). Beer deal of the night: 22oz. mug of Sam Adams Oktoberfest for $4. He have dropped the "K", but as a fan of his first book (and Mac commercials as "PC" and McSweeney's pieces and "Daily Show" appearances) I will call him John K. Hodgman. After the absurdist, Pythonesque humor of his first book, "Areas of My Expertise", I'd read anything he writes. 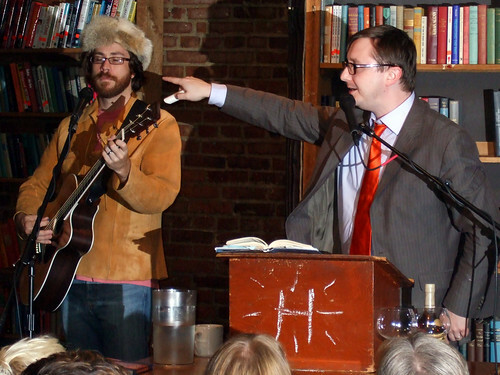 Hodgman returns to his hometown of Brookline for a reading from the 2nd book with Yale buddy & singer-songwriter Jonathan Coulton pitching in with a little music here and there. Friggin' awesome punk rock from around the globe (and Boston) with headliner Jay Reatard. Extra points to an all-female band from Vancouver calling themselves "Vancougar". If you don't know how to get advance tix at the Middle East, ask there or email me. This is a heartbreaking story of Thomas Young, a soldier who was serving in Iraq for a week before he was paralyzed. Phil Donahue co-directed so you can imgaine there's a lean to the left, but I believe the core of the documentary is a view into Young's life after Iraq. Members of "Iraq Veterans Against the War" will facilitate a discussion. There's no other place to be tonight. I don't care if the Sox are playing in the World Series -- they have TV's. I don't care if it's your mom's birthday -- the food is fine in the restaurant. This is the '76-'78 lineup of DMZ, Boston's first great punk band. Somehow they're doing a show at Maxwell's in Hoboken on the weekend, and this is their first show with this lineup since a reunion about 15 years ago. The New Frustrations and Red Invasion will rock you, but DMZ is the only thing that matters tonight. Okay, I geek out for old-school punk rock (see above), but this is a spectacularly good night of music at a venue with superlative acoustics. The Willard Grant Conspiracy don't reside in Boston anymore, we can be proud that they started here. Who knows who will play with WGC mastermind Robert Fisher, but I'm amazed one can experience them in such an intimate setting. If you don't already love them, fans of American Music Club and Tindersticks will dig this. Chris Brokaw played with Thalia Zedek darkish-rock band Come, and he's pretty awesome in general. I think you'll like Drew O'Doherty also. It's considered a cinematic masterpiece. This is a story about a military force from a first-world country as an unwelcome occupier of a Muslim country with torture of the citizens and many guerrilla attacks. For the electro folks. There are rather detiled directions on Oxfam Cafe's MySpace. I think they'll work. "Iron Pour: Magic, Fire, Music, and Dance"
A site with slang and cultural touchstones from around the country. Find out how people talk or correct someone else's entry.